This video interactive was used to kick off my coverage of Woods Hole Oceanographic Institution’s 2014 “Dive and Discover” expedition, which took place aboard the R/V Atlantis as it sailed in the eastern Pacific for four weeks. 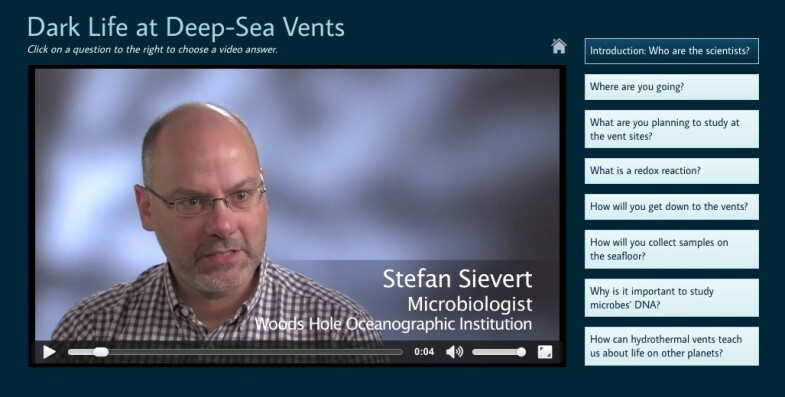 The interactive features co-principal investigators Stefan Sievert and Jeff Seewald, who answer key questions about the goals of the research cruise, the challenges of working at sea, and the mysteries they hope to reveal about microbes that live at hydrothermal vents on the ocean floor. Edited in Final Cut Pro 7. Click here to visit interactive. This interactive was produced as part of Woods Hole Oceanographic Institution’s 2014 Dive and Discover expedition, for which I served as onboard correspondent.